Kathakali is a stylized classical Indian dance-drama noted for the attractive make-up of characters, elaborate costumes, detailed gestures and well-defined body movements presented in tune with the anchor playback music and complementary percussion. It originated in the country's present day state of Keraladuring the 17th century and has developed over the years with improved looks, refined gestures and added themes besides more ornate singing and precise drumming. Theyyam is a popular ritual form of worship of North Malabar in Kerala, India, predominant in the Kolathunadu area (consisting of present- day Kasargod, Kannur Districts, Mananthavady Taluk of Wayanad and Vadakara and Koyilandy Taluks of Kozhikode of Kerala) as a living cult with several thousand-year-old traditions, rituals and customs. 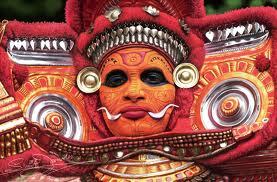 The performers of Theyyam belong to the lower class community, and have an important position in Theyyam. People of these districts consider Theyyam itself as a God and they seek blessings from this Theyyam. A similar custom is followed in the Tulu Nadu region of neighbouring Karnataka known as Bhuta Kola. Ottamthullal is a performance art from Kerala, India. This art was founded by Kunjan Nambiar one of the Prachina Kavithrayam in Malayalam. The art form was created during the 18th century by legendary Malayalam poet Kalakkaththu Kunchan Nambiar. The story goes that Nambiar, who was playing the mizhavu for a Chakyar Koothu show, dozed off in the middle of the performance, thus inviting ridicule from the Chakyar. The humiliated Nambiar vowed to come up with an alternative art form to Chakyar Koothu, and conjured up an Ottamthullal show that also made fun of prevalent socio political equations and prejudices of the region.Ottamthullal, over the centuries, has a single actor, donning a green makeup and wearing colorful costumes (which once prompted Pandit Jawaharlal Nehru to once remark that Ottamthullal is "poor man's Kathakali") and reciting the Thullal lyrics (dance songs), all the while acting and dancing himself. Koodiyattam, one of the well known classical dance dramas,was originated 2000 years ago in Kerala. It is believed that the history of drama of Kerala began with Koodiyattam. It was performed in the Koothambalams of temples- the place of worship of Hindus. The members of Chakyar Caste were the actors in the beginning, but now, there is no such restrictions. Famous Sanskrit works are used for Koodiyattam performance. One of the wonderful fact about it is that women also participated in it and shares equal status with men in the performance. The meaning of Koodiyattam is “dancing together ”. All the four types of abinaya, angikaram, vachikam, sathvikam and aharyam are fully utilised in Koodiyattam. Mohiniyattom, which is also known as “Kerala Nadanam”, is a unique dance form of recent origin. 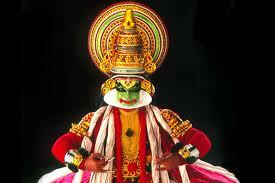 The influence of Kathakali and Bharata Natyam are very much evident in it. In the beginning, it was performed by women, but now it was performed by man also. Mohini means” temptress” and Mohiniyattom means “the dance of Temptress”. Chakyar Koothu is a traditional dance form of Kerala that is performed in the temples. Chakyar Koothu was originally performed only in Koothambalams of Hindu temples. It is a highly refined monologue where the performer narrates episodes from Hindu epics like Ramayana and Mahabharata. Sometime it is done as stand-up comedy act, incorporating commentary on current sociopolitical events. Oppana is a traditional dance form of the Malabar Muslims. Performed by both men and women, Oppana is accompanied by clapping of hands. It is a part of the wedding entertainment and festivities. Maidens and young female relatives sing and dance around the bride while men stand aside singing songs, ready to receive the bridegroom. The theme is often teasing comments and innuendoes about the bride’s anticipated nuptial bliss. This form of dance is often presented as a stage item today. Duffmuttu is also known as Aravanmuttu or Arbanamuttu , is a dance form particular to the Muslim community of Kerala. The origin of Duffmutt can be traced back to the Arabs. It is still accompanied by Arabic music. The name Duffmuttu is attributed to the use of an instrument called duff or tap. Duff is a round percussion instrument with one side covered with hide and is used to produce rhythm. Thiruvathirakali is a dance performed by women, in order to attain everlasting marital bliss.Tiruvathira dance is performed by maidens who revolve in a circle while performing dance steps to the beat of rhythmic claps that gives music to their graceful movements and the narrative song sung by the dancers as they go round.. The dance is a celebration of marital fidelity and the female energy, for this is what brought Kamadeva (the god of love) back to life after he was reduced to ashes by the ire of Lord Siva. The sinuous movements executed by a group of dancers around a nilavilakku(lamp), embody 'lasya' or the amorous charm and grace of the feminine. The dance follows a circular, pirouetting pattern accompanied by clapping of the hands and singing. Today, Thiruvathirakali has become a popular dance form for all seasons. Margamkali is very ancient and the most famous artistic performance among the Syrian Christians of Kerala. Margamkali is performed mainly by men on festive occasions especially during the time of marriage. A dozen dancers sing and dance around a lighted lamp in the simple traditional white dhoti. Now a day’s women also perform Margomkali only as a stage item. North Kerala has many rich art traditions, of which "Thitambu Nritham" is one. It is mainly performed by Namboothiris of this part of Kerala, and rarely other Brahmanan communities, say for example, Embranthiris. 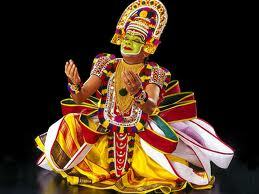 Krishnattam is the another form of dance drama. It depicts the frolics and divine of Lord Krishna which is enacted in Guruvayoor Temple. This unique dance form is now performed in many stages both for religious and tourist entertainment. The performance lasts for eight days and covers the whole span of Krishna's life from his birth to 'Swargarohanam' or ascension to the heavens.